When you have dinner guests during the summer it is easy to offer ice cream for dessert. Of course you do not want to turn on the oven or prepare elaborate things. This recipe provides a homemade fresh cup that is also ideal if you have important guests. Wash the lemons in a bowl and grate the peel of one, in the same bowl beat the egg yolks with the sugar until they become white, then add the vanilla and cornstarch. Squeeze the lemons and until you have ½ cup of juice. Pour the juice into a container with 1 cup of water. Stir this liquid in with the egg whites. Pour the preparation into a sauce pot and cook, stirring constantly with a wooden spoon until it reaches a creamy consistency. Turn off the heat and continue stirring to avoid the formation of skin on top, keep stirring until it has cooled down. Cover with plastic wrap and place in the fridge. Wash the berries. 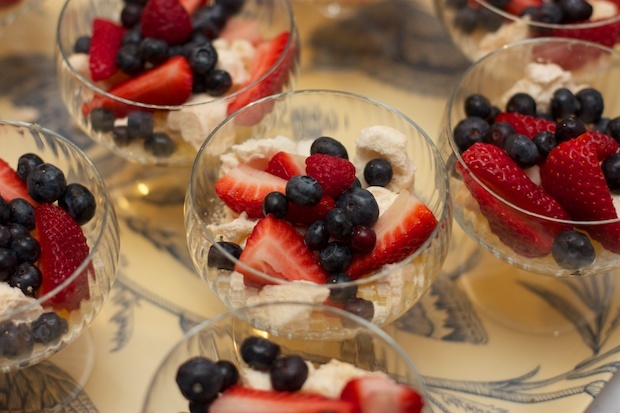 Place the cream in individual glass bowls, break up the meringue on top of the cream in each cup, add the berries and serve.